TSX-V: CWV: Crown Point Energy Inc. (“Crown Point” or the “Company”) today announced that it is filing on SEDAR and is mailing a Letter to Shareholders and Management Information Circular for the Shareholder Meeting (the “Meeting”) scheduled for February 24, 2015. In the documents, Crown Point presents compelling reasons for its shareholders to vote the white proxy and approve the US$8.5 million second tranche private placement of shares (the “Second Tranche”) with two strategic investors, and vote against the attempt by dissident LAIG Oil Investments (“LAIG”) to take control of the Board of Directors and the Company. “The February 24 vote is critical to Crown Point’s future. Shareholders need to act now to protect their investment and prevent a disingenuous dissident from taking control of Crown Point. We are asking shareholders to vote the white proxy and give the green light to growth, investment and experience and to halt LAIG’s opportunistic plans,” said Crown Point Chairman, Gordon Kettleson. The complete Letter to Shareholders from Crown Point is included at the end of the news release. This document, along with the Management Information Circular, will also be available on www.crownpointenergy.com/proxycontest and on SEDAR, www.sedar.com. The proxy voting deadline is 10 am (Calgary Time) on February 20, 2015. FOR a US$8.5 million second tranche private placement of shares (the “Second Tranche”) with two strategic investors. Among its many benefits, the Second Tranche will provide essential funds that will allow Crown Point to continue with near-term exploration and development initiatives, which so far have been favourable. AGAINST an attempt by dissidents led by LAIG Oil Investments (“LAIG”) to take control of the Board and the Company. Be aware that LAIG has not disclosed all material information to you, especially a demand that Crown Point issue to LAIG a control block of equity and warrants (the “Inferior Proposal”) at a price that is well below the Second Tranche financing price. Your Company has a highly experienced management team and a strong majority-independent Board. We believe that we are poised to increase production, cash-flow and reserves by carefully deploying for exploration and development the funds we receive from the Second Tranche. We are confident that our strategy will create value for the benefit of all shareholders. Don’t accept what the dissidents are telling you at face value. Read the Management Information Circular to understand why you should be skeptical of LAIG’s self-described capabilities. Our research indicates that it may have exaggerated its history and failed to disclose its shortcomings and the inexperience of its dissident nominees as directors of publicly traded companies. LAIG has presented itself to you as Argentine, but elsewhere it admits to being a foreign investor in Argentina. We believe that LAIG’s agenda is to gain control of Crown Point’s Board and then pursue a self-serving financing strategy, all of which is designed to gain control of the Company at the expense of Crown Point and its other shareholders. We think that LAIG launched this costly and distracting proxy contest to further that agenda. Crown Point’s Board and management team has carefully navigated the Company through a difficult period in Argentina and now our strategy is working. We designed it to deliver low-risk growth and capitalize on large potential exploration upside in Argentina. Our primary focus at present is to increase production in Tierra del Fuego (TDF) through exploration and development drilling. The evidence of our progress is the 14-well exploration and development program underway in TDF. We have issued operating updates to keep you informed, and on page i and ii of the Management Information Circular we have provided a summary of the program’s results so far. The TDF exploration and development program is critical to Crown Point’s growth but of course it comes with a price tag. In 2015 we are budgeting to pay approximately US$7.4 million for our 25.78% share of TDF capital expenditures, the majority of which will occur in the first half of the year. This includes approximately US$1.3 million to wrap up our 14-well program and US$6.1 million as our share of an anticipated five-well 2015 follow-up program that is currently in the planning stages. This is one of the key reasons why we arranged the US$8.5 million Second Tranche private placement with our two strategic investors (the “Strategic Financing”). We have negotiated the best possible terms for the Strategic Financing and we are confident that it is the best source of financing available to fund our growth program. We ask that you vote FOR the Second Tranche of the Strategic Financing. We urge you to vote AGAINST the dissidents, who are seeking 60% of the Board seats while owning just 5% of Crown Point’s shares. Instead, you should continue to support our incumbent Board, who collectively own 22% of Crown Point’s shares. LAIG proposes to replace our seven strong and capable non-management directors. Read the Management Information Circular to see why our non-management directors are far superior to LAIG’s dissident Board nominees. Moreover, we believe that LAIG’s strategy has severe shortcomings. By closing Crown Point’s Calgary head office, LAIG would eliminate the valuable contribution of our Calgary-based executive team in the form of strategic leadership, technical operations experience, financial management and capital markets experience, Canadian corporate governance expertise and Canadian regulatory compliance and disclosure expertise. And then there is the cornerstone of this entire proxy fight: LAIG’s Inferior Proposal. Given its significance, shareholders should be troubled that LAIG has not disclosed its Inferior Proposal publicly, particularly since LAIG has criticized our Strategic Financing. What else is LAIG not telling you? As you read our Management Information Circular, we think you will agree with us that no weight should be given to LAIG’s claim that it will deliver “greater transparency and more clarity in communicating to the market.” Our view is that the opposite is more likely, given the shortcomings that we believe exist in LAIG’s disclosures to date. LAIG is working for itself, not you or the other Crown Point shareholders. The strongest evidence for this is the superiority of the Second Tranche to the Inferior Proposal. 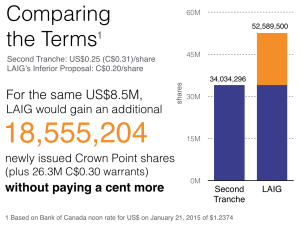 The Second Tranche price is US$0.25, currently equivalent to about C$0.31: this represents a 55% premium to the C$0.20 unit price of LAIG’s Inferior Proposal and a 77% premium to the January 21, 2015 closing price of Crown Point’s shares on the TSX Venture Exchange of C$0.175 per share. 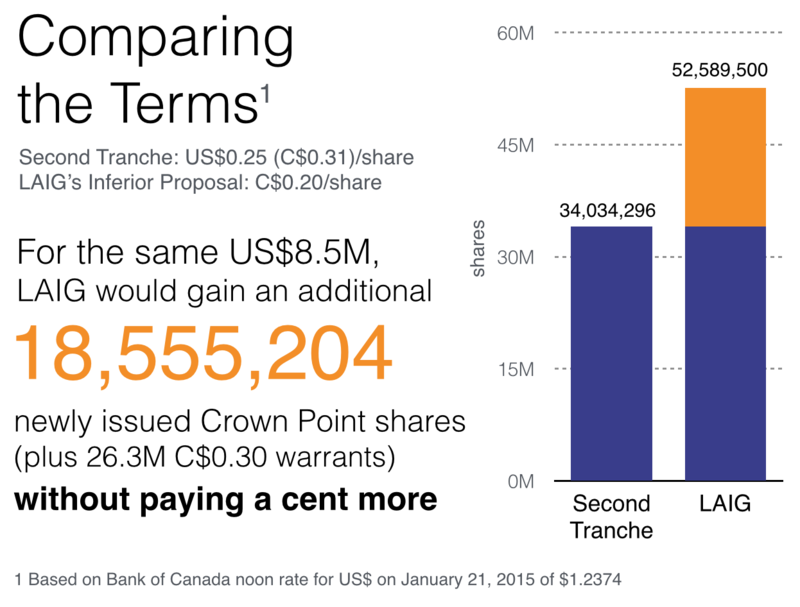 In addition, unlike LAIG’s Inferior Proposal, the Second Tranche does not include additional dilutive warrants, which under the terms of the Inferior Proposal would provide LAIG with a right to acquire even more Crown Point shares at a fixed price of C$0.30 per share for an unspecified period of time. Put another way, if Crown Point were to work with LAIG under the terms of its Inferior Proposal to raise the US$8.5 million planned under the Second Tranche, LAIG would get nearly 52.6 million shares, or 18,555,204 more shares than Crown Point proposes to issue under the Second Tranche. Moreover, LAIG would get warrants to acquire another 26.3 million shares. Every vote, no matter how many shares you own, is crucial. If the Second Tranche is rejected and LAIG’s dissident nominees seize control of the Board, Crown Point’s financial future will be at LAIG’s mercy. Don’t vote to give LAIG the power to impose the Inferior Proposal on Crown Point. Vote FOR the Second Tranche, the premium Strategic Financing price and the advancement of our exploration and development plans. We have turned the corner and we believe that our future looks bright. As you will read in the Management Information Circular, LAIG is well aware of the investment opportunity in Argentina following the 2012 YPF nationalization, which in LAIG’s own words caused a drop in the value of oil assets in Argentina of up to 90%. Don’t let LAIG bargain shop at your expense. To be sure, the past few years have been difficult in Argentina, and not just because of the YPF nationalization. Our Board and management team have carefully navigated the Company through currency controls, repatriation challenges, strikes and inflation while Argentina suffered a reprimand from the International Monetary Fund, defaulted on its debt, and devalued the Peso. Even if our stock price has not yet rebounded, it appears that Argentina is turning the corner just as we are. We believe the long-term outlook for natural gas prices in Argentina remains favourable. Unlike North America, there is insufficient production in Argentina to meet demand. Argentina imports natural gas at prices above US$10 per million cubic feet, which is substantially more than double the average price we received in 2014. Argentina’s domestic natural gas shortage is especially important for us, because our production is weighted approximately 80% to natural gas. As for Argentina’s government-regulated oil prices, oil from our TDF concessions is being priced at approximately US$70 per barrel starting in January 2015. While that’s a decline of approximately 9% from the US$77 per barrel price in place from May 2014 to December 2014, the decline is relatively small compared with the recent sharp price slump in global crude oil markets and is not expected to have a material impact on our cash flows. The January 2015 TDF price is approximately 43% higher than the closing price on January 21, 2015 of approximately US$49.03 per barrel for global benchmark Brent crude. Argentina, as a nation, has a priority of reducing its reliance on imports of energy by encouraging growth in domestic oil and gas production. We are already well positioned to benefit from these market conditions through our exploration and development program and by developing our high-quality concessions in Argentina. We believe that the recent appointment to our Board of nominees of our two strategic investors will further accelerate this growth. We can now leverage their financial capabilities and local business networks to assist our management team. We expect to be able to access new opportunities through acquisitions and farm-ins on strategic assets. We believe that the dissidents’ shortcomings are significant, their proposed head office closure is reckless and their financing strategy is self-serving. Be aware that the remaining incumbent directors of Crown Point will resign rather than participate in LAIG’s self-serving plans. By requisitioning a shareholder meeting to put forward dissident nominees with no disclosed experience managing or directing a Canadian public company, LAIG has forced us to incur significant expenses at a cost to ALL Crown Point shareholders. And if LAIG wins control of the Board, Crown Point will have to pay LAIG’s expenses too. It is unfortunate that Crown Point and its shareholders are being forced to absorb such costs and needless distraction, particularly when at the June 12, 2014 AGM shareholders voted 96% in favour of five of the directors that LAIG now seeks to remove. Don’t reward LAIG for imposing requisition-related costs on Crown Point. Help us avoid the excessive dilution that would result from the Inferior Proposal that LAIG has demanded and the risks of its nominees’ inexperience as directors of a Canadian public company. Crown Point has a great future, a highly experienced management team and a strong majority-independent Board, reflecting best governance practices. The Board owns 22% of the shares and is committed to creating shareholder value for the long term. We are confident about our strategy. We have the support of our new strategic investors. And – with the funds from the Second Tranche – we will have the capital we need to execute our exploration and development plans. I encourage you to read the enclosed Management Information Circular and visit our website www.crownpointenergy.com for further detail on the matters raised in this letter. After that, please help us continue with our positive momentum by voting the WHITE form of proxy today FOR the Second Tranche and AGAINST the dissidents. I would like to thank you for your ongoing support as we move forward together to build a stronger Crown Point. This letter contains forward-looking information (“FLI“). All information and statements contained herein that are not clearly historical in nature may constitute FLI. We believe that the expectations reflected in this FLI are reasonable; however, undue reliance should not be placed on this FLI, as there can be no assurance that the plans, intentions or expectations upon which they are based will occur. This letter contains FLI concerning, among other things: the anticipated effects on changes in commodity prices on our anticipated cash flows; the expected benefits and results of completing the Second Tranche and the proposed use of proceeds; our belief that we are poised to increase production, cash-flow and reserves and that our strategy will create value for the benefit of all shareholders; potential benefits of certain Argentine energy policies on us; our ability to deliver low-risk growth and capitalize on large potential exploration upside in Argentina; our ability to increase production in TDF through exploration and development drilling; the estimated costs of our exploration and development programs; our view that the long-term outlook for natural gas prices in Argentina remains favourable; our assessment of LAIG’s plans and the potential impact on us and other shareholders if LAIG is successful; the potential benefits of the Strategic Financing and the potential consequences (including dilution) of completing the Inferior Proposal; our future business strategy, including accessing new opportunities through acquisitions and farm-ins on strategic assets; and our belief that with the funds from the Second Tranche we will have the capital we need to execute our exploration and development plans. A number of risks and other factors could cause actual results to differ materially from those expressed in the FLI contained in this letter including, but not limited to: the risk that the remaining portion of the Second Tranche is not completed in a timely manner (or at all) or on the terms presently proposed; the risk that we are unable to realize the anticipated benefits of the Strategic Financing; the risk that the Second Tranche is not approved by shareholders; the risk that our TDF program does not result in additional incremental production or result in the identification of additional drilling locations; incorrect assessments on third party intentions and actions; risks associated with oil and gas exploration, development, exploitation, production, marketing and transportation; risks associated with operating in Argentina, including risks of changing government regulations (including the adoption of, amendments to, or the cancellation of government incentive programs or other laws and regulations relating to commodity prices, taxation, currency controls and export restrictions, in each case that may adversely impact us), nationalization of assets, price controls on commodity prices, inability to enforce contracts in certain circumstances or obtain redress for breach of contract in the court system and the potential for a sovereign debt default or a hyperinflationary economic environment; inability to access sufficient capital from internal and external sources; and other factors described in our Annual Information Form, which is available for viewing on SEDAR at www.sedar.com. Readers are cautioned that the foregoing lists of factors are not exhaustive. With respect to FLI contained in this letter, we have made assumptions regarding, among other things: our ability to fully complete the Second Tranche in a timely manner (or at all) or on the terms presently contemplated; our ability to continue as a going concern without the loss or forfeiture of any assets; our ability to obtain qualified staff, equipment and services in a timely and cost efficient manner; drilling results; the costs of obtaining equipment and personnel to complete our capital expenditure program; the ability of the operator of the projects which we have an interest in to operate the field in a safe, efficient and effective manner; our ability to obtain financing on acceptable terms when and if needed; field production rates and decline rates; our ability to replace and expand oil and natural gas reserves through acquisition, development and exploration activities; future oil and natural gas prices; currency, exchange and interest rates; the regulatory framework regarding royalties, taxes and environmental matters in the jurisdictions in which we operate. The FLI contained herein is made as of the date of this letter and we disclaim any intent or obligation to update publicly any such FLI, whether as a result of new information, future events or results or otherwise, other than as required by applicable Canadian securities laws. The FLI contained in this letter is expressly qualified by this cautionary statement.